The 2017/2018 Mount Royal Cougar winter sport season closed its curtains in late February as the only two Cougars squads who qualified in the winter semester, have been eliminated out of playoff contention. Women’s volleyball and men’s hockey both had rewarding regular-seasons by finishing in the top half of the league standings and qualified to the Canada West playoffs to begin a hunt for the regional championship, but had their seasons cut short before any history could have been made. As predicted earlier in the year, the Cougars’ most prominent team made another deep playoff run despite a shaky season overall. MRU finished 12-14-2 in the Canada West standings and clinched the final playoff spot to mark their fifth straight playoff appearance. The Cougars traveled to Manitoba for a weekend in the ‘Herd’ of the Bisons and to many people’s shock, swept them on the road 2-0. In the head-to-head matchup, the Cougars did only win one of four games against the Bisons this year, but in their second match-up of the season in Calgary, MRU displayed that they can compete with them splitting the series with a restored and injury free squad. In the quarter-final showdown, a last minute goal from Cougar captain Jaime King secured a 3-2 win in game one and the next night, a MRU squad carried a 4-1 lead heading into the third period. The Cougars held a late Manitoba push to seal the series with a 5-3 win led by Jamal Watson’s three point performance. Watson led the team in points with six in four games. Next up for the Cougars was a meeting against the top-ranked team in the nation, the Alberta Golden Bears in Edmonton the following weekend. Alberta swept all regular season games against MRU, outscoring them 19-4. In what would’ve been a huge ‘what if’ situation, the Cougars pushed the Golden Bears to an overtime in game one but in a series of unfortunate events unfolding in such a vital shift, they dropped the game. Cougar forward Josh Bly heroically blocked a shot from the point but was slow to get up while defenceman Maddison Smiley got knocked down behind the net seconds on. This led to the Golden Bears pouncing on a tired and battered defensive unit to seal a 1-0 lead heading into game two the next night. After rookie Brad Kennedy cut the Golden Bears’ lead in half at 2-1 inside the second period with his second goal of the playoffs, the Golden Bears scored four straight goals to take any hopes of a Cougar comeback go away and end the MRU hockey season with a 6-1 win. Despite having 10 first-year skaters on the team and a late addition midway through the season, MRU put up a great second-half performance to solidify playoffs and get eliminated in the Canada West semi-finals for the second straight season. 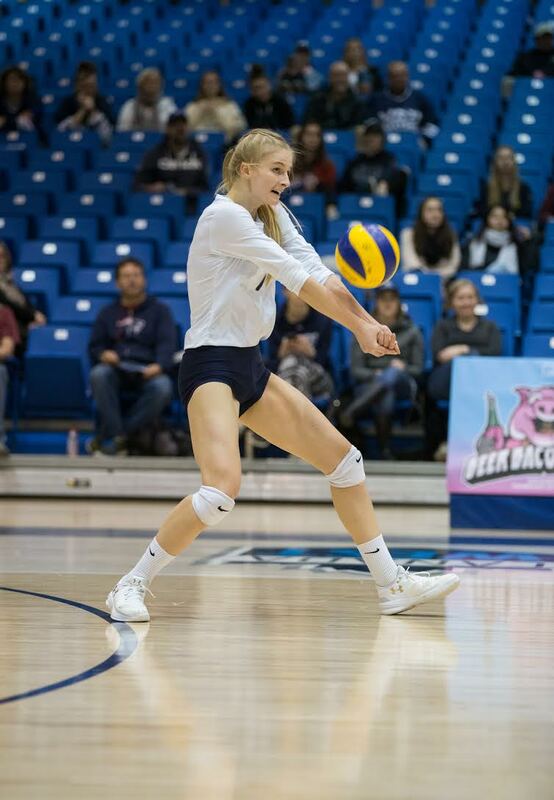 MRU’s women’s volleyball squad also qualified with the final playoff spot to make the playoff for the third straight season. Led by Canada West second team all-star fifth-year Alex Donaghy, the team’s only senior, the Cougars finished the season with an 11-13 record. MRU had a modest 6-6 record at the turn of the calendar but picked up key victories in Manitoba against the Bisons and Brandon Bobcats who were also in the playoff mix, to secure their spot in the playoffs. The Cougars’ task was to be their most difficult, being pit against first-place in Western Canada University of Calgary Dinos who swept the Cougars in the final-regular season weekend. Like the men’s hockey team, odds were severely stacked against the Cougars but the roles of the underdogs were switched. The Dinos routed the Cougars in game one winning in three sets (25-8, 25-12, 25-22) in just 76 minutes of game time. With the season on the line, MRU knew they had to put up a stronger performance to even have a chance at an upset but despite a valiant effort, the Cougars fell short and dropped game two (25-21, 25-23, 25-22). Key highlights came from Allisa Dandenault who had the teams 12 of 22 aces in game one, Quinn Pelland had 33 of 40 aces in game two, while Chantel Park led the team with 20 kills in the two games.